A traditional Indian oven-cooked dish blending rice with authentic spices, and meat or vegetables - it is hugely popular in Indian restaurants. This delicious mild version with sultanas, fennel and mint couldn't be easier to make. In a saucepan, stir fry the chicken breasts in a little oil for three minutes. 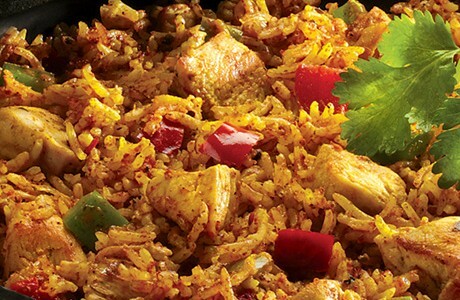 Pour over a jar of Patak’s Mild & Fruity Biryani Sauce and add the uncooked Basmati Rice and 4tbsp of water. Bring to the boil, pour into an ovenproof dish and cover with a tight fitting lid.